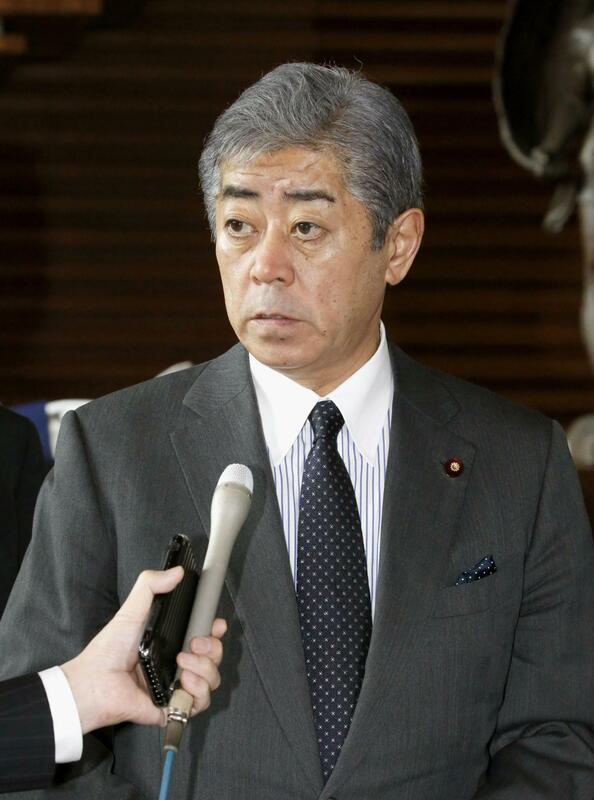 Defense Minister Takeshi Iwaya rejected on Friday a request by Okinawa Gov. Denny Tamaki for a one-month suspension of land reclamation work in the Henoko district of northern Okinawa Prefecture, further deepening tensions over the controversial project to relocate U.S. Marine Corps Air Station Futenma within the prefecture. Later the same day, the Okinawa Prefectural Government filed a new lawsuit against the central government’s temporary nullification of a decision by the prefecture to withdraw its earlier permission for reclamation work in the Henoko district. The lawsuit is likely to further intensify political tensions between Tokyo and Okinawa, which hosts a large number of the U.S. military bases and units despite strong anti-military sentiment among many local residents. “We’d like to steadily proceed with the work so that the Futenma base can be returned as soon as possible,” Iwaya said Friday morning during a media briefing. The central government is now expected to continue its land reclamation efforts for construction of the new base, pouring further earth and sand into the sea off the coast of the district on Monday. Iwaya confirmed that the Defense Ministry will proceed with the plan, dependent on weather and other conditions. “Without relocation to Henoko, the Futenma base will remain fixed at its current location. That’s something we must absolutely avoid,” Iwaya said. Tamaki — who was elected last year on a platform of strongly opposing the Futenma relocation project — met Prime Minister Shinzo Abe on Tuesday in Tokyo. 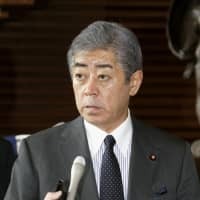 During the meeting, Tamaki had proposed that the construction work on the Henoko project be suspended for one month to allow more time for talks between Tokyo and Okinawa. Responding to the lawsuit filed Friday afternoon, a Defense Ministry spokesman promising to complete the relocation project. “We will continue dialog, through various opportunities, and try to win the understanding of the local population,” said Hajime Aoyagi, press secretary for the Defense Ministry, after the Okinawa Prefectural Government filed the lawsuit at the Naha branch of the Fukuoka High Court. “We will then try to realize the relocation and reversion of the Futenma base as soon as possible by progressing (with construction works) on the step-by-step basis,” he said. Futenma air station is located in the densely-populated area of Ginowan, in central Okinawa, where local residents say it causes intense noise pollution and increases the risk of accidents. Nonetheless, a majority of Okinawa residents oppose Tokyo’s plan to relocate the base within the prefecture, saying other parts of Japan must share more of the burden in hosting U.S. military bases. Prime Minister Shinzo Abe has repeatedly expressed his determination to build an alternative base in the Henoko area. Officials in Tokyo argue that removing the Futenma base from the prefecture would reduce the U.S. military’s deterrence power, and could send the wrong message to China. Beijing regularly dispatches ships to the waters in the East China Sea surrounding the Senkaku Islands, which are claimed by both Tokyo and Beijing. The territorial dispute over the islands, known as Diaoyu in China, are seen as a potential flash point for a military conflict between Japan and China.